The Erinyes (the Angry Ones), aka the Furies and the Eumenides (the Kindly Ones), were three women sent to avenge the souls of the dead. The Erinyes (“the Angry Ones”), also known as the Furies and the Eumenides (“the Kindly Ones”), were three women sent to avenge the souls of the dead, and bring about justice. The three were named Alecto, (“the never ending”) Megaira (“envious anger”) and Tisiphone (“voice of revenge”). They appeared as hideous women with with serpents entwined in their hair, and they often carried whips and torches. Aeschylus presents them as personifications of those curses which a murdered man, himself, directs against his murderer. It was also believed that Erinyes avenged the injured or dead whose blood had been shed by a blood relative, especially patricides and matricides. There are many versions of their origin, the most common is that they were the daughters of Acheron and Nox (Night). Another popular origin of the Furies was that they were born of the blood of mutilated Ouranos in Gaia’s womb. 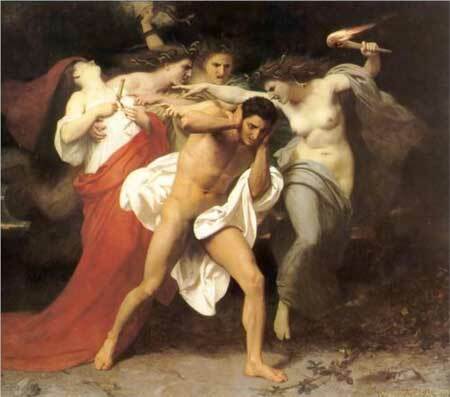 One myth tells how they pursued Orestes because he had killed his mother, despite the fact that Orestes had acted in compliance with the direct command of Apollo. However, according to Aeschylus, the Furies were finally persuaded to abandon their persecution of Orestes after the acquittal of Orestes by the Areopagus. This verdict calmed the anger of the Furies, and they were henceforth known as the Eumenides.